The Tor Project, the gold standard of online anonymization tools, is reporting that within the last few days, there’s been an uptick in the Iranian government’s actions against domestic Internet access. Over the past 48 hours it seems the Great Persian Firewall is updating to attempt to block a number of circumvention tools, including Tor. 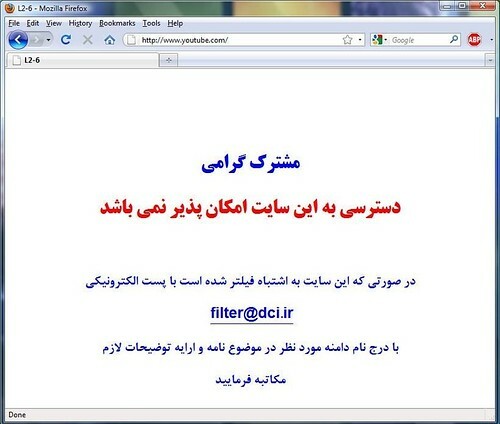 Iranians and their diaspora have been reporting to us that Tor, Hot Spot Shield, UltraSurf, and Freegate are all experiencing connectivity problems from inside Iran to the outside world. Our research indicates that ssl-based communications are being throttled to 2 kilobit per second rates or simply blocked altogether. This is inclusive of basic ssh, ssl, vpns, and other proxy technologies. We’re continuing to work on what’s really happening and likely means to counter. The short answer is to use bridges that are not on port 443. Given Iran’s recent rhetoric against Green Movement leaders as well as its planned 10 day assault against the Green Movement what Tor and others may be seeing is the digital realization of these political statements and actions within the country. In the past, changes to Iran’s filters have been tested on certain ISPs within the country before being implemented nationwide. If the regime is moving towards digitizing its most recent statements and actions, what the Tor Project is seeing now could be localized testing of a planned national rollout. From my perspective, this is yet another episode in the constant cat-and-mouse game that is being played out in Iran. Given that the number of connections from Iran to the outside world is around a half dozen, futzing with port blocking and other forms of censorship is pretty trivial.